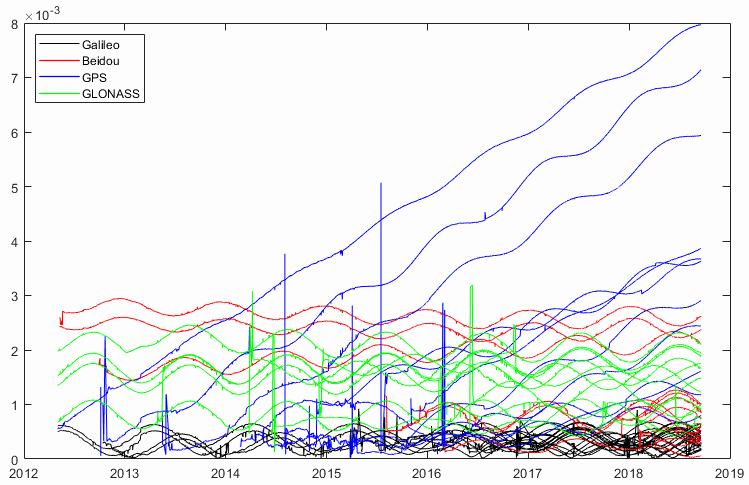 When comparing GPS, Beidou, Galileo, GLONASS, and potentially other GNSS, we can see that the eccentricities of GPS spacecraft are increasing with time (i.e. apogees increasing and perigees decreasing). Is this an orbital perturbation that GPS has decided to leave uncorrected in the space segment (preferring a software solution, which should work) while other GNSS maneuver to minimize? The below plot was generated using TLE eccentricities from Space Track for all GNSS spacecraft launched after ~October 2011. I wouldn't have suspected GPS satellites to be corrected less often than other GNSS. But I would guess they don't need to be as close to a circular orbit so long as the orbital parameters are reasonably accurate in the ephemeris the satellites send to GPS receivers. So long as the user can determine the satellite's position, it shouldn't matter too much if the orbit is more eccentric than other satellites. Not the answer you're looking for? Browse other questions tagged orbit gps station-keeping gnss or ask your own question. How does GPS receiver synchronize time with GPS satellites? Would GPS work above the GPS satellites? Do GPS receivers use trilateration or distances between satellites? How does GPS module gets time even before a fix? How many satellites would be required for Solar System GPS? Is GPS time at least “really close” to TAI (International Atomic Time)?